Washington (CNN) – Mitt Romney's lunch at the White House Thursday was not how the former GOP nominee would have imagined it a month ago, but it did provide a postscript to this year's punishing presidential battle. The defeated Republican presidential candidate lunched on white turkey chili and southwestern grilled chicken salad with President Barack Obama in the private dining room, where their discussion centered on "America's leadership in the world and the importance of maintaining that leadership position in the future," according to a description of the lunch from the White House. "They pledged to stay in touch, particularly if opportunities to work together on shared interests arise in the future," read the statement from the White House, which also released a photo of the two men in the Oval Office. The two men discussed domestic and foreign policy issues, including how to maintain America's leadership and help spur innovation, according to a Romney aide. Anyone but Obama and Romney themselves can only speculate on the actual words exchanged Thursday, since the meeting was closed to all press. It was the first meeting between the rivals since they faced off in an often-contentious presidential election campaign, and was one of the rare moments the two actually faced each other in person. Aside from their three presidential debates, Obama and Romney met only once during the 2012 campaign, at an annual fund-raising dinner in New York on October 18. Even before this year, the two men have rarely crossed paths, meaning their lunch Thursday is only the eighth time the pair has met face-to-face. The meeting appeared to be a show of bipartisanship as the two men discussed how to maintain American leadership. While word of the meeting raised a bit of speculation that Romney could possibly be considered for some kind of position in the administration, there was no indication from the White House or from Romney's aides that was discussed. The president first mentioned meeting with the former Massachusetts governor in his victory speech in Chicago on Election Night, saying he looked forward to "sitting down with Gov. Romney to talk about where we can work together to move this country forward." Following the meeting, Ryan issued a statement saying he was "grateful to Governor Romney for the honor of joining his ticket this fall, and I cherish our friendship." "I'm proud of the principles and ideas we advanced during the campaign and the commitment we share to expanding opportunity and promoting economic security for American families," Ryan continued in the statement. A Ryan aide said the meeting was "constructive and positive," and focused both on reflections from the campaign and on upcoming fiscal and economic challenges for the country. Romney has mostly stayed out of the spotlight since his Election Night concession remarks in Boston, where his campaign was headquartered. While Romney hasn't made any public appearances after the election, comments he made on a post-election call that Obama had won by giving "gifts" to key constituencies were immediately criticized by both Democrats and Republicans. A national poll out this week indicated Romney's favorable rating was down from pre-election levels, likely due in part to those controversial comments to donors two weeks ago. Romney, who lost to Obama by 126 electoral votes, said the president courted voters by offering policies - some of them this election year - that appealed to key constituencies. Those comments may be a factor in the drop of Romney's favorable rating among Americans. According to a CNN/ORC International poll released Monday, 43% of the public had a favorable impression of the defeated GOP nominee, down six points from just before the election. And Romney's unfavorable rating edged up to 50%. It's not, however, unprecedented: victors have long invited their former rivals for ice-breaking sessions following bitter contests, though some races (including the battle between George W. Bush and John Kerry in 2004) have ended with only a phone call. "I think there is a tradition here and I think that it is one of the often overlooked but remarkable things about this democracy, this oldest democracy, is that we have, we consistently have elections and either pass power on to a leader of a new party or - because the voters choose - continue to invest power and authority in the office in the same party or same individual without violence and without the kind of anguish and disruptions that you see in so many other countries around the world and you've seen through out history," White House Press Secretary Jay Carney said on Wednesday. "And I think it is entirely appropriate - and I know the president feels this way - to continue that tradition," he added. At nice move – talk business or talk family – I'm sure they will have something to say to each other. This makes Obama look gracious, and if the Republican whine they look tacky. Nice move. Hope he wipes the tears before he gets out of the limo. Obama should feed Romney toast. Wonder how the White House chef is preparing that Crow for Mr. Romney. Why are we so bothered about Obama calling Romney for lunch? It is a simple event in which Romney had made campaign contribution to Obama's re-election and he is one of the lucky winners to have lunch with Obama. Media is making a hype out of campaign tactics. Obama is just proving that people do get to eat with him if he so announces in his campaign! The End. did you bring your tax returns with you? If not, you will have a crow! This voter hopes that nothing more comes out of this lunch date than both of these men getting fed what they deserve. Lol. Now both of you! !, get to work fixing my nation or your both in time out!!! Romney should not give Obama the time of day. Obama's campaign was not honorable in any way. It was built on character assassination, lies and straw men issues. The top 400 wage earners in the U.S., as reported by Forbes Magazine, have seen their aggregate wealth quintuple over the last 20 years (from $300 billion to $1.5 trillion). During that same period, workers productivity has doubled, but their income has remained stagnant. In 2009 (the most recent year for which there is data), 25% of those top 400 earners paid less than 15% in taxes (the payroll tax during that same time was 15.3%). It's time for the wealthiest Americans to pay their fair share. It's the least they can do for the country that has given them so much. 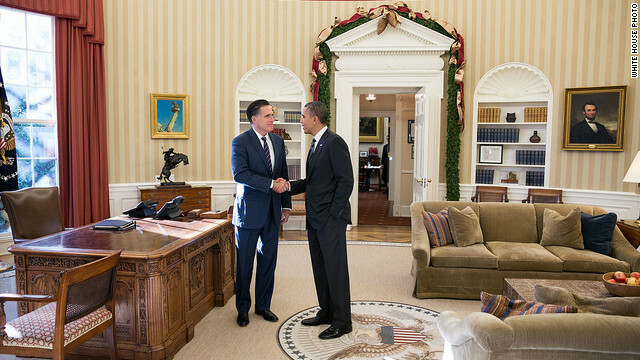 Very civil of the president to lunch with Mr. Romney. Perhaps a Sec. of State position is in the offing? I can only imagine that once again Obama will eat Romney's lunch.! I think it is a good move and very gracious of both of both of them to do it. I hope Obama uses Mitt Romney's business expertise. I suggest people read the book "Political genius of Lincoln".